At Lithia Chrysler Dodge Jeep Ram FIAT of Eureka, our team likes to provide our consumers with detailed information about the vehicles they have in mind so that they can make the best choice for their needs. If you are looking for a family-friendly minivan, the Chrysler Pacifica is popular model with consumers, which is partly because of its innovative interior features. The interior offers the available Uconnect Theater. This is one of the best entertainment systems in its class. It comes with dual 10.1-inch HD touchscreens that feature a Blu-ray player, wireless headphones, wireless streaming, available games and apps, dual HDMI inputs, and more. 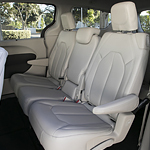 The interior also offers versatility with the available class-exclusive Stow 'n Go Seating and Storage System. With this system, the second-row seats can be easily folded for additional storage space, and this system allows up to 243 seat configurations. The Stow 'n Go Seating and Storage System make it easy to load and transport large cargo.